Sergey ‘Krusher’ Kovalev (31-2-1, 27 KOs) will be making his first defense of his WBO 175lb. title against Igor Mikhalkin (21-1, 9 KOs) on March 3 on HBO at Madison Square Garden in New York. Kovalev’s management wanted Sullivan Barrera for the fight, but he decided to fight WBA light heavyweight champion Dmitry Bivol for his title. 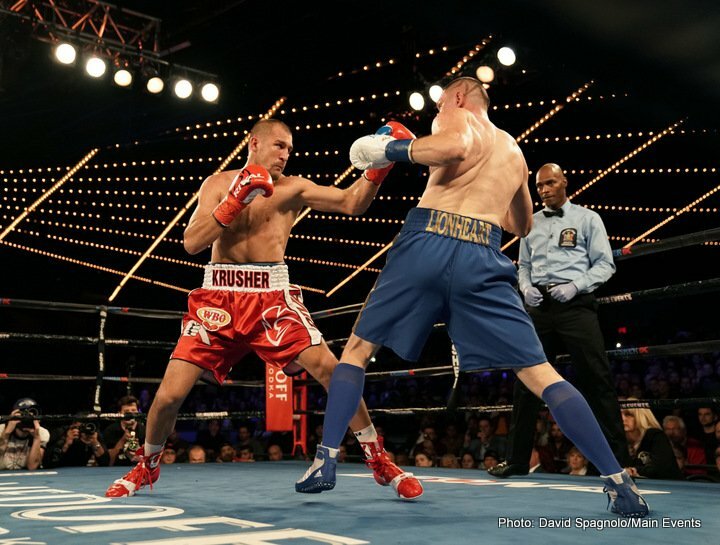 Kovalev vs. Mikhalkin is a showcase fight for the ‘Krusher.’ Mikhalkin lacks the pop in his punches or the defensive skills to hold Kovalev off for any length of time. This fight could be over by the 2nd round even under the best case scenario. Barrera is the mandatory challenger for Bivol. That fight could end up as the co-feature bout for the Kovalev-Mikhalkin match on March 3. Mikhalkin is ranked #5 WBC and #7 IBF. Mikhalkin looks to be on the same level talent-wise as Kovalev’s last opponent Vyacheslav Shabranskyy. Kovalev stopped Shabrankyy in the 2nd round in a fight televised by HBO. It didn’t make for an exciting fight due to the one-sided nature of it. If Kovalev destroys Mikhalkin in a similar manner, then it’ll be a negative for HBO. Kovalev has been involved in a lot of mismatches over the years. When he did fight a good opponent in Andre Ward, he was twice beaten. Some boxing fans are grumbling about Kovalev defending against the 32-year-old Mikhalkin, because this is a fighter that has never beaten a top talent during his 10-year pro career. When Mikhalkin did fight a contender 7 years ago, he was beaten by Aleksy Kuziemski by a 10 round unanimous decision. Mikhalkin has done a good job coming back from that loss in defeating Thomas Oosthuizen, Hakim Chioui and Doudou Ngumbu. Mikhalkin hasn’t faced any of the quality contenders in the 175 lb. division like Barrera, Joe Smith Jr., Badou Jack, Oleksandr Gvozdyk, Marcus Browne or Eleider Alvarez.